One of my favorite things about camping is waking up to the sounds of birds singing right outside the tent. Although rolling out of bed to begin your workday might not be quite as relaxing as waking up in nature, a new app created by the Carnegie Museum of Natural History can make it more peaceful by turning your alarm into a symphony of bird songs. Available for free on Apple’s App Store as well as on GooglePlay, the app, Dawn Chorus, allows you to choose up to five bird songs out of twenty varieties, all native to the northeastern United States. The bird calls are thanks to the Cornell Lab of Ornithology’s Macaulay Library, which houses the world’s largest archive of animal sounds. 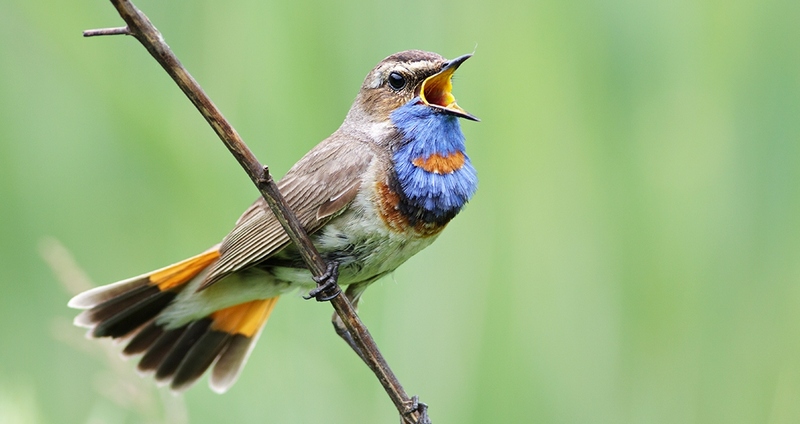 In addition to your learning each bird’s song, the app also offers information about their habits and habitats. One of the best things about Dawn Chorus is you can curate the order of the birds you want to hear. I like to start out with the melodic tune of the Ruby-crowned Kinglet and end with the calls and pecking noises of the Yellow-bellied Sapsucker. There is also a convenient 10-minute snooze option. Since Dawn Chorus requires that you keep your phone off its mute setting throughout the night, and I can’t risk being prematurely woken up by an incoming email at 3:00 a.m., I don’t usually use it as my morning alarm. However, I find the melodic calls are the perfect way to end my timed meditation in the morning, and my son loves to use Dawn Chorus as the reward at the end of his two-minute teeth brushing.